With a sleek, airplane-shaped seat and a hidden storage compartment in the rear, kids will have a blast racing around the playground on Italtrike’s ABC Jet Tricycle. The plastic seat easily adjusts to fit children from two to five years old, so kids can enjoy this brightly colored trike for years. The sturdy steel frame with powder-coated finish stands up to heavy playground use, while the special steering design eliminates pinch points and spokeless wheels help prevent injuries. 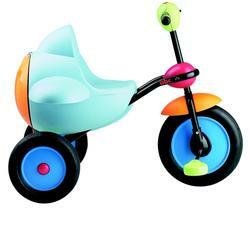 This brightly colored, well built tricycle will have your child cruising in style! Internal mechanism restricts wheel from turning more than 45 degrees left or right, reducing the danger of tipping. Made in Italy. 25 x 19.5 x 17"